It is not quite HQ2, but Amazon’s big plans for its expanded presence in Vancouver are becoming all the more apparent. 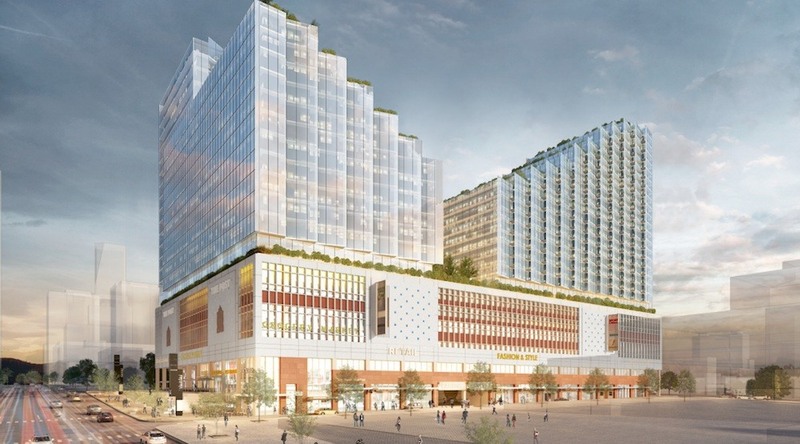 A source who wished to remain anonymous told Daily Hive there is significant interest from the Seattle-based e-commerce and entertainment giant to take over a large portion of the former Canada Post building in downtown Vancouver. 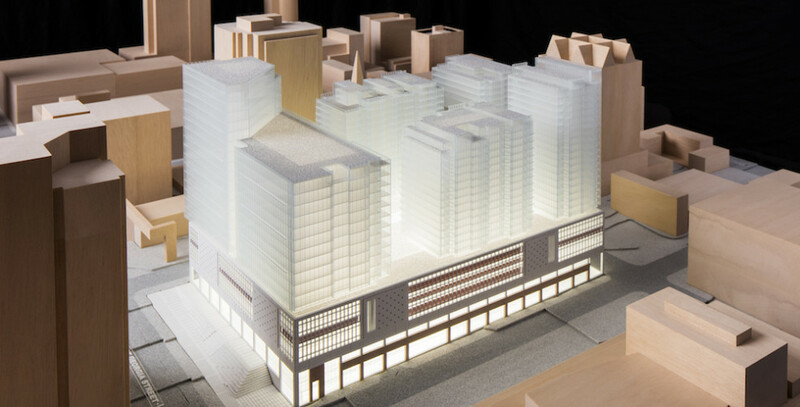 The city block-sized building at 349 West Georgia Street would undergo a redevelopment that retains the heritage facade and much of the structure, in addition to new towers above. 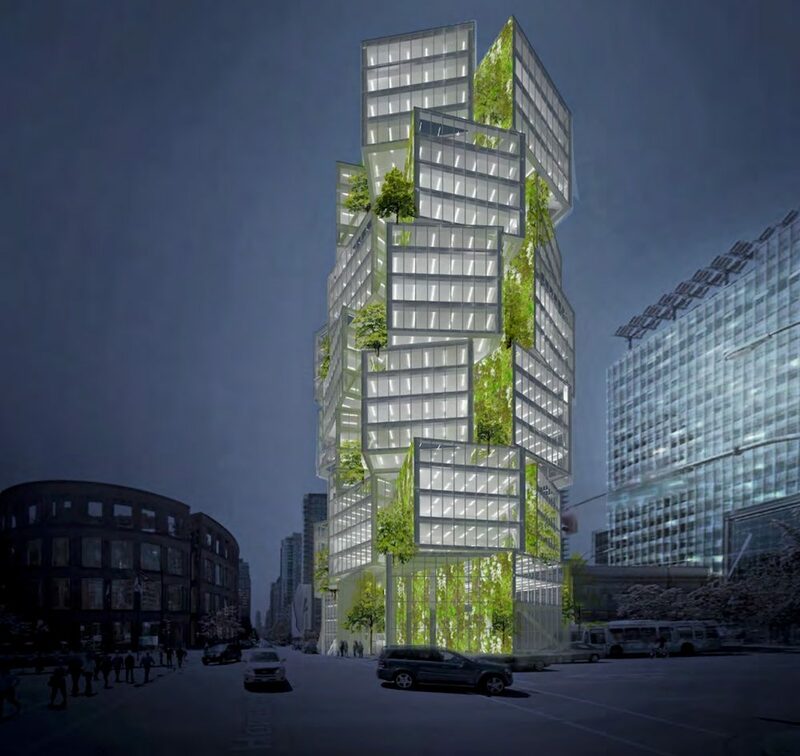 However, such a project would be a major departure from the previous concepts proposed by property owner BC Investment Management Corporation, developer Bentall Kennedy, and architectural firm Musson Cattell Mackey Partnership. 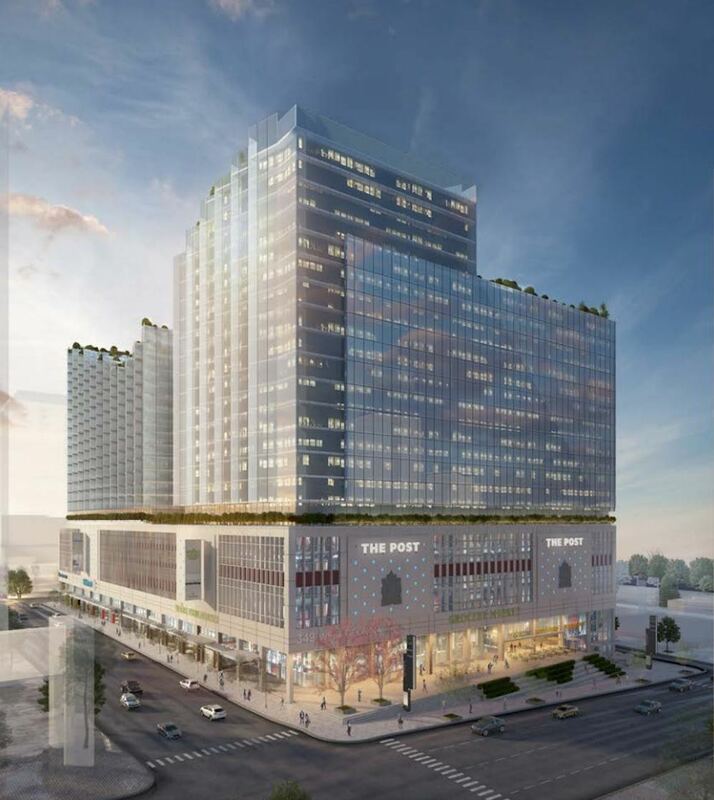 According to the commercial real estate source, the project will revert to being an office and retail project – no residential units are planned. 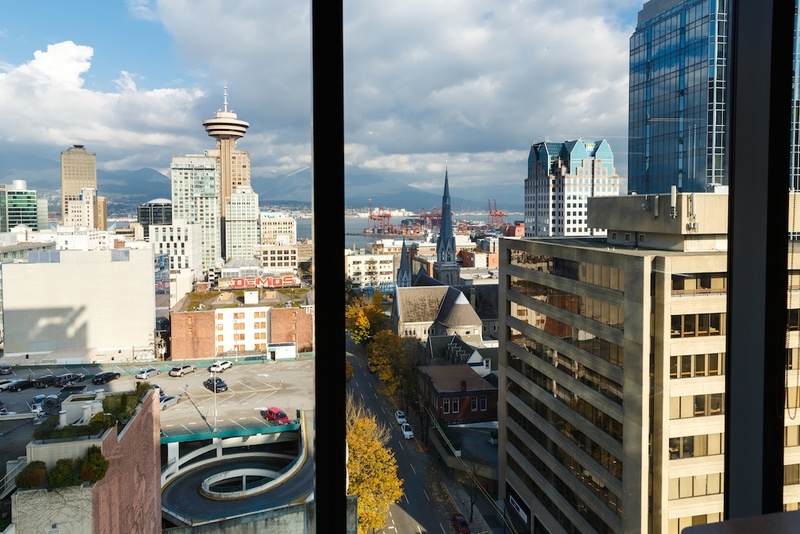 A 2016 rezoning application called for five towers up to 19 storeys rising on top of the 1958-built building, increasing its floor area from 686,000 sq. ft. to over 1.5 million sq. ft., including 300,000 sq. ft. of retail and 500,000 sq. ft. of office space, with the remainder being residential. Taller towers are currently prohibited on the site. 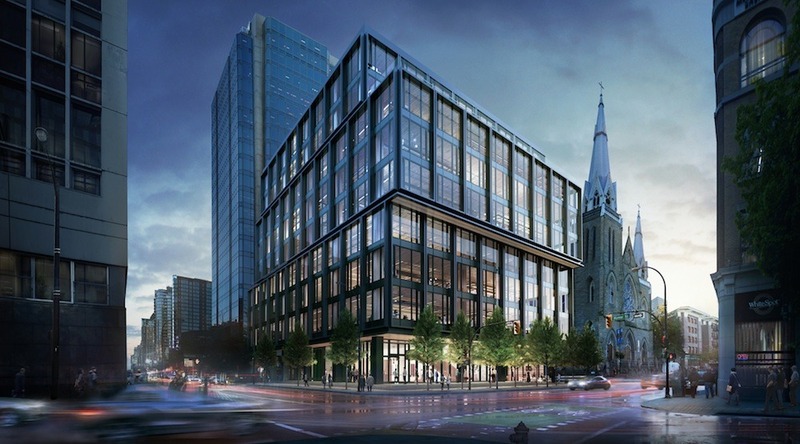 Shortly after in spring 2017, the proponents filed a modified rezoning application with three slimmer towers and a reduced building mass. A third rezoning application is expected later this year. The source also previously said Amazon will takeover Westbank’s new 24-storey office tower, which will replace the Budget Car Rental at 400 West Georgia Street near TELUS Garden. The municipal government’s review process for the tower was expedited, and the project was approved this past February. Site preparation for construction has now commenced. Amazon’s short-term expansion plans in the city revolve around a new nine storey, 150,000 sq. ft. office building being built at 402 Dunsmuir Street – right across from the old Canada Post building. Construction has begun for a completion in early-2020. Until the new building opens, Amazon will continue to occupy 80% of the 80,000 sq. ft. of space at WeWork’s first co-working office location in the city at the Bentall III office tower. The company’s current anchor presence in the city centre is its 91,000 sq. ft. office space within TELUS Garden. Amazon aims to increase its local workforce from 1,000 to 2,000 with the opening of the new Dunsmuir Street office building, and further office expansion at 400 West Georgia Street and the old Canada Post building redevelopment – effectively creating a multi-building Amazon office precinct – could increase the workforce to about 5,000 employees by the mid-2020s. Canada Post moved its Metro Vancouver processing centre from downtown Vancouver to a new $200-million facility at Vancouver International Airport in 2014. Since then, the building has been leased as a temporary studio space for the local film and television production industry, including major original projects by Amazon Prime and Netflix. Amazon and the proponents of the old Canada Post building redevelopment could not be immediately reached for comment.